1. The flameless sitting buddha LED candles with 4&8 timer lighting. 2. Improving your house relaxing atmosphere. 3. Advanced LED flickering light and meditating peace harmony, unique table decor with religious blend. No smoke or scent, won't cause any dangerous fire case. No mess or dripped, so don't worry about the cleaning. It is safe for pregnant Mother, Children and Pets to use. Specifications: Made of real wax, acurately replicating the three dimensional shape, size 4.7 x 13.1 x 9.5 inches. Buddha Candle Requires 2xAA Batteries (Not Included), small Candle Requires 2xCR2032 Batteries (Included), unscented. 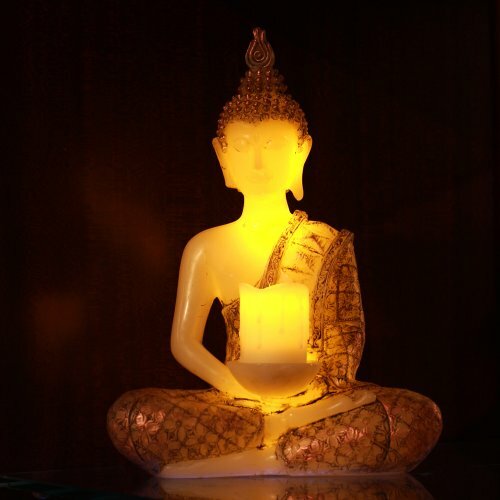 Improving Relaxing Atmosphere: Our flameless sitting buddha LED candles bringing a relaxing atmosphere to any space. Spark new life and serenity in your home. Classic flair to your indoor space with this stately, handcrafted candle holder. 4&8 Timer Functions: The flameless sitting buddha LED candles 4/8 Timing function. A cycle of 24 hours. 6 hours lights up, 18 hours off, automatically turn on at the same time on the next day. Glow time is approximately 500 hours per battery pair. Great For Gift: A perfect present, this Seated Buddha is wonderful for special occasions such as weddings, housewarmings, birthdays and more. So nice you'll want to keep it at home for everyday use. Enjoy! By whole house worlds. After-sales Service: Any quality issues about our pillar led candle, you can contact us directly, and we will handle it within 24 hours, thanks for choosing Home Impressions, we will always be there to serve you. NEW DENIM WoodWick Glass Jar Scented Candle, Large 22 oz.